Published on 07/08/2013 filed under Type Specimens & Fonts. A strong, sturdy looking typeface with unusual proportions that make it particularly good for use in larger sizes, it’s also designed so that it can fit into tight or limited spaces. It has a moderate contrast and to me, it really conveys a certain authority. Trola comes in light, regular, semibold, bold and heavy so it has a wide range of possibilities and looks particularly eye catching in in bold italics. 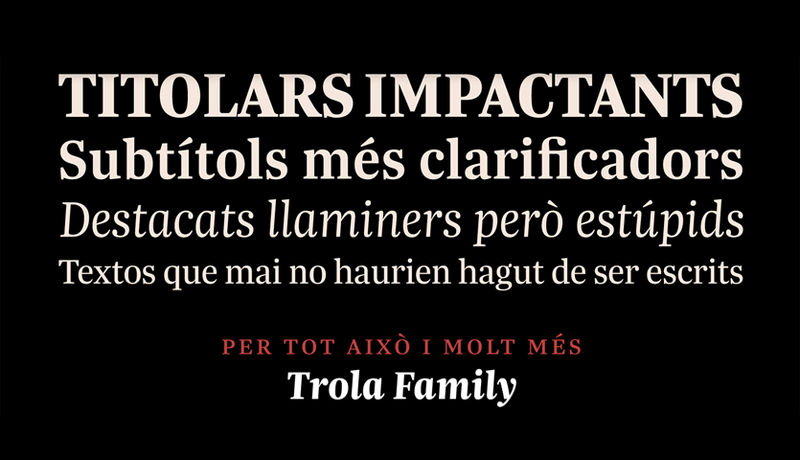 Designer Jordi Embodas is also the creator of Orenga typeface, Pona typeface and Textosterona, be sure to check them out on his website and you can get a nice overview of Trola on the MyFonts website as well.